So, a new ceasefire agreement emerges from the Minsk summit. Forgive me if I fail to applaud, especially as it allows another couple of days of mayhem before it even is meant to come into effect. The sad truth of the matter that what happened in Minsk has everything to do with optics, nothing to do with substance. Getting Merkel, Hollande, Poroshenko and Putin together pretty much ensured that the summit had to lead to something. Had Putin simply dug in his heels and rejected every overture, then he would have been demonstrably the villain of the peace. More to the point, he would have personally snubbed Merkel and Hollande, and political credibility and amour proper would have forced them to push for a tougher line in Europe. As is, this ensured that Russia will not be on the agenda for the 12 February summit of EU leaders. Now, though, they are at least for a few days committed to seeing this ceasefire agreement through, at least until—like the last one, let’s not forget—it is demonstrably a hollow sham. It also puts Poroshenko into a bind. He cannot afford to alienate Europe, nor can he appear not to be able to control his own security forces, so he needs to demonstrate adherence to the terms of the ceasefire, at least at first. That includes the withdrawal of artillery no more than two days after the start of the ceasefire, as well as combat units from the front line. If the government forces do this but the rebels do not, then this opens up the scope for a one-off coup de main by the latter (Debaltseve? The Avdiivka coke plant? Mariupol?). The terms of the ceasefire include nuts and bolts issues that are welcome and may actually be achievable, such as prisoner exchanges. They also include big picture issues that neither Poroshenko nor Putin technically ought to be able to promise. The text includes reference to specific constitutional reforms in Ukraine, for example, something Poroshenko can’t just sign away on his own authority. But perhaps more striking is the extent to which the fig leaf over Russia’s role is looking ever more tattered as a result of this deal. Putin, in effect, was willing to commit the rebels to such issues as troop withdrawal and even political reform. Let’s dwell on that for a moment. Putin, the president of a country that time and again claims to have no control over the rebels, is willing to redraft their political system and speak for their military deployments. Pull-out of all heavy weapons by both sides to equal distance with the aim of creation of a security zone on minimum 50 kilometres apart for artillery of 100mm calibre or more, and a security zone of 70km for MLRS and 140 kilometres for MLRS Tornado-S, Uragan, Smerch and tactical missile systems Tochka U. But honestly the accumulation of evidence of Russia’s role in this war is such that one more contribution makes little real difference. The question is whether this deal is any more likely than the last to do more than, perhaps, quiet the guns for a little while. This would only be the case if the positions of any of the key players—and Merkel and Hollande are not—have changed. Poroshenko is still talking total war, while not delivering. He would like to see the war end, and at least this deal formally puts and end to talk of secession in the Donbas. However, the war has never really been about the constitutional status of south-eastern Ukraine. Instead, it has been about Moscow’s unwillingness to allow Kiev to believe itself sovereign, about Russia’s refusal to countenance the tectonic drift of Ukraine towards Europe. On this, Poroshenko shows no signs of being willing—or able—to compromise. Likewise, nothing much seems to have changed for Putin. He still wants Kiev broken, and needs a win. Russia is hurting, though more for reasons of the oil price slump than sanctions, but it is neither down nor out. More to the point, Putin and his closest allies are still doing fine, and the Russian masses do not yet seem inclined to blame him for their current troubles. His record is of encouraging discussions, summits, accords and all the rest of the usual paraphernalia of modern diplomacy, not as a way to settle disputes but to prolong them. With one hand, he signs the communiqué, but with the other he waves on his infiltrators and arms convoys. Besides which, we also need to be cautious as to how far Moscow truly controls Donetsk and Lugansk—and, indeed, how far they control their thuggish field commanders. At present, the locals are willing not to denounce the agreement, but they have no reason to do so, not least as if they are planning to ignore it, they hardly want to signal this, and embarrass Putin in the process. But whether they are really going, for example, to hand over control of the border to government forces remains to be seen. I hardly seem them about to surrender their supply lines to Russia, which is what this would mean. In any case, that would only apply after Kiev has agreed constitutional reform, and no one looking at the fractious parliamentary politics of Ukraine is likely to expect a quick and harmonious outcome there. 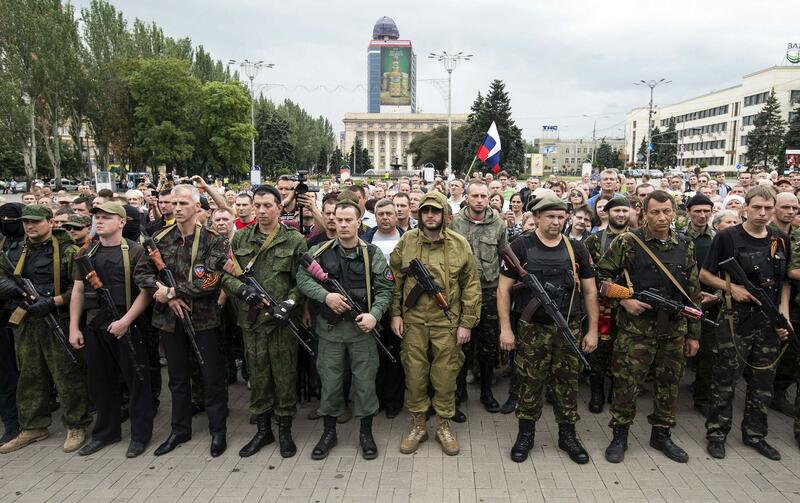 Of course, even a strategic pause may help Ukraine more than the rebels. But it may not. The irony is that at least briefly, this is likely to take the pressure off providing the government forces with more advanced US weapons, and could actually prove a step closer to freezing this conflict. Besides which, there are many ways in which Russia and its local proxies can repudiate the ceasefire, from provoking fire from government troops to accusing Kiev of failing to observe the clause which calls for the removal of outsider, “mercenary’ troops—which would mean purging the National Guard of foreign volunteers, especially in the notoriously-autonomous ultra-nationalist units such as the Azov Battalion. I am not sure how easy this would be, even if Kiev tries to enforce it. Of course, I could be wrong. I certainly hope so. It would be lovely to think this was the first step towards a lasting peace, and not just the next act in Russia’s unfolding exercise in creative disruption. But I won’t be holding my breath. The Battle of the Big Beasts? Would an expanded MVD give the FSB a run for its money? Absolutely correct in stressing the timegap before Ukraine would have control of the border. Official Ukrainian sources are already privately – and perhaps not so privately- expressing concern about this. Reblogged this on Arte y Cultura Perú. Excellent summation of the situation and the challenges. Unless there are secret appendices and accords that we are not privy to, which gives Putin what he wants with no NATO or EU membership ever for Ukraine or a Donbas vote and veto. I can’t see how this is different to Minsk 1, or why there is going to be a different outcome this time? Unless the Russian economy is in more trouble than it looks or the threat of defensive weapons pushes potential costs higher than I would expect then it is just another, no cost, PR coup and popularity boost for Putin, where he has faced down the weak West again, with French and German peace at any price to keep the gas flowing in Europe. As you say there is a real danger of the buffer zone being taken over by the ‘uncontrollable’ mercenaries, who are ‘nothing’ to do with Putin. So until the next round in a few months and another 500-1000sqkm of Ukraine under Russian control, I guess we are all going to have to in the meantime take a front seat and wait for Putin’s next moves. The West’s weak response and negotiating efforts, certainly send the message loud and clear; why bother sticking to the rules and International Law, when war and violence gets you what you want every time. I’m sure this will continue to be noticed by other assertive people in the world so we can expect more global instability, while the West wring their hands. What exactly can Russia do to stop this, short of marching on Kyiv (which it doesn’t look as if it can do)? What about the change of an Ukrainian federation? I would like to read your thoughts on that. Where do we start to remember – Cyprus, Vietnam – and the same people somehow or trained by those before – What does Putin gain? – nothing but the world who will never trust him, his thoughts of China supporting him as the US pulls out of China and the unemployment and people return hom and dreaming of Vietnam and the Mongolians taking over Russia again..
Politician’s syllogism. We must sign SOMETHING. This is something. Therefore we must sign this. Putin must be hugging himself, since he didn’t want a deal anyway. He got to sign something, which spares him some awkwardness, but it has almost no content and certainly no content that will trouble him much. The point about the Tornado-S being included is rather interesting. As far as I’m aware (please correct me if I’m wrong) but the 9A53-S has not actually entered production yet. Was there a mistake in the transcription? I’m aware of the 9A52-4 Tornado, but still have seen no proof that the 9A53-S Tornado-S variant has actually entered production. Although your link suggests it is in service with the Indian Army, the Tornado-S doesn’t appear to be listed in any of their reported equipment lists. Besides which, since the Tornado-S is a BM-30 Smerch upgrade, its already explicitly covered in the article 2 sentence listing the types of heavy artillery to be withdrawn. What I meant by it being a transcription mistake is that Grads are _not_ specifically listed in that line. So did the agreement originally/actually state Tornado-G’s rather than Tornado-S, which would make more sense considering its expanded range. According to The new Minsk ceasefire: A breakthrough or just a mirage in the Ukrainian conflict settlement?, a report put out by the Finnish Institute of International Affairs – which is very good on such things – the Tornado-S came into service in 2012. It hasn’t been exported. Thanks Mark. I’ve contacted them directly to ascertain their sources. Cheers! For me this is just Putin doing the modern day rendition of the 1972 Paris Peace Accords. For those to young to remember the French hosted Peace Talks in Paris for the North Vietnamese and the U.S. to discuss a “Peace with Honor.” All the Vietnamese did was delay, stall with absurd requests to include arguing about seating arrangements at the negotiating table. Then President Nixon tired of it all and authorized UNRESTRICTED bombing of N. Vietnam and the mining of Haiphong Harbor. The war was over in two weeks in Dec of 1972. I was in Vietnam as a Marine to see this all. Fast forward to today. While Ukraine does not have the ability to bomb like Nixon did nor is Europe or the U.S. going to, it amazes me that Obama, Hollande, Merkel, and Cameron cannot, or won’t, see that history is repeating itself. Putin is doing what the N. Vietnamese did 43 year ago. And remember it was RUSSIA that backed the N. Vietnamese. After all where does one think they got their T-54/55 Tanks from? The lesson here is while bombing like Nixon did is out of the question it is time to stop playing the fool with Putin’s stalling tactics and ARM UKRAINE. It is time for Merkel and Hollande to stop playing a modern day Neville Chamberlain and face reality, not the bubble they currently live in. What Europe wants and what reality are, are two different things. It is time for Obama, Merkel, Hollande, and Cameron to grow up and face both the music and reality. Or they can continue to played for fools by Putin and look like the clowns they currently appear to be. I’d remind you how Vietnam worked out was also a matter of that being an unwinnable conflict from South Vietnam being completely and utterly incapable of supporting itself. Now, I would hope the Ukraine is not South Vietnam, but that is the parallel you force to be drawn. Brute force will not solve anything if one the actors that needs to use it has shown repeatedly it cannot do so. But, for the OP, I wonder, can Ukraine really do anything at this point? You yourself wrote an article on how incompetent Ukraine’s military is. Judging by history, such as the Vietnam, and perhaps Afghanistan War, one cannot prop up states that are incapable of defending themselves, not on a permanent basis. I would hope the Ukraine is not like South Vietnam, but what’s the evidence to the contrary? I’m not even touching on how, judging by reports elsewhere, the Ukraine is about to go completely bankrupt. I don’t see Germany, judging by how stingy they are economically as it is with other affairs, being willing to give the Ukraine free cash, which is essentially what would have to happen here. I guess my point is, one of the reasons Putin may win is because of how incompetent the Ukrainian government unfortunately is. The implications for the Ukrainian populace are worrisome, but on the flip side, this does perhaps suggest he cannot just repeat the tactic, because the same ground factors won’t be in his favor. Very good analysis. This is beginning to look like the Korean War, with diplomacy being used in conjunction with the fighting. Looks like a long conflict in store for all of us. Europe will have to stand firm, if she is to survive. Salient points, Dr. Galeotti, all ! Thanks for providing the link to the details. Sometimes “thugs with tanks” actually DO pay attention to the boss. This one question is a very wild card for Vladimirovich in the unfolding of what you have aptly named his “unfolding exercise in creative disruption… Is that more popcorn I hear popping ?